a range of complex aromas. Its alcohol rate reaches 8,2%: your best friend for the winter! Background:I’m continuing my quest for anything imported by 12 percent imports. When I saw this one at State Line I figured I would do a Christmas in July review. There are rich roasted malts on the nose, along with some spice and pleasant floral hop aromas. We are starting this one at 43 degrees. There are sweet rich malts up front then a nice creamy mouthfeel in the middle of the sip. There is not much going on in the back end, it is very smooth and easy to swallow. There is a slight malt bitterness developing on the back-end. Everything comes together in the finish. Rich malts, some spicy notes and a very pleasant hop dryness. There is a definite hop presence but there is no hop bitterness. This is one delicious bier. However I’m afraid I may have poured some of the lees into the glass. I was a little aggressive on that pour. The bier is now at 63 degrees. The flavors are really coming out now that the bier has warmed and opened up. It’s a shame that it was so delicious I only have a few sips left. I am really enjoying this brew. I like this Christmas is July stuff, I’ll have to see about doing some more Christmas beers this month. I’m going to give this one a B+. 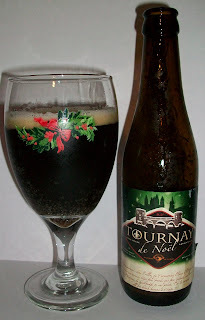 This is an excellent Christmas Ale full of rich malt flavors and some spice as well. There is also a noticeable hop presence in this ale.